Flowing water—in Hawaii’s streams, rivers, and irrigation ditches—can be used to generate electricity. Hydroelectric facilities were among the first power plants in the islands, dating back to the late 1800s. Hawaii uses what are known as “run-of-the-river” hydro plants. Some water is diverted out of a running stream and piped to the power house which contains the hydroelectric turbine-generator. After spinning the turbine, the water is returned to the stream. 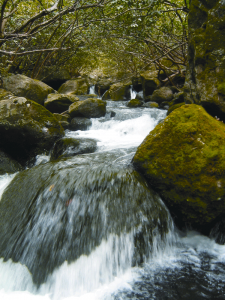 The Oak Ridge National Laboratory (ORNL) National Hydropower Asset Assessment Program (NHAAP) is an integrated energy, water, and ecosystem research effort for sustainable hydroelectricity generation and water management. ORNL’s partners include state and federal agencies, non-governmental organizations, technology and resource developers, utilities, and researchers.